The Hermle Tellurium III is the new development within our Tellurium series. 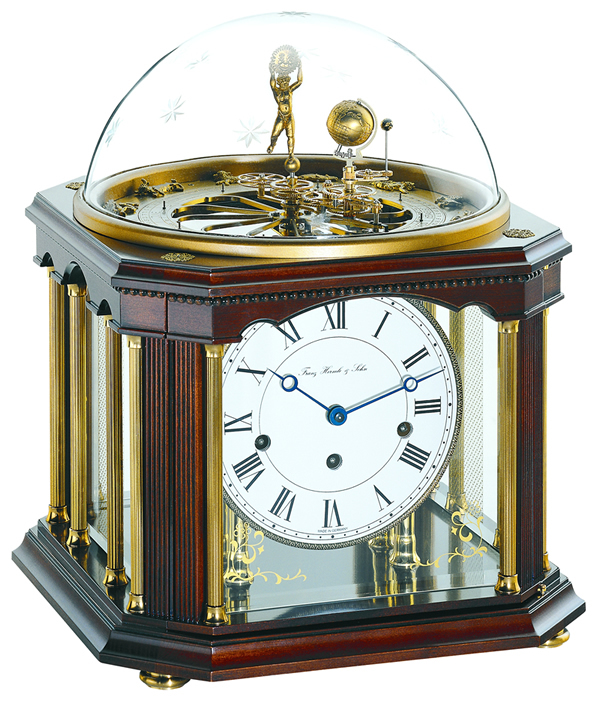 The mechanical 8-day 4/4 Westminster chime bell strike movement with 11 jewel escapement and automatic night shut-off activates the mechanism showing the movement of sun, moon and earth in the course of the year. The antique walnut finish solid wood case with front and back door, metal applications, pearl decor, brass columns and bevelled glass, will be dominated by the glass dome´s hand-cut stars. The turning sun-god, earth globe, moon and zodiac signs are metal cast matching the colour of the etched date disc. Enamel dial and filigree hands underline the unique character of this outstanding design. Click here to view the Hermle 22948-Q10352 Walnut Options and Prices page.